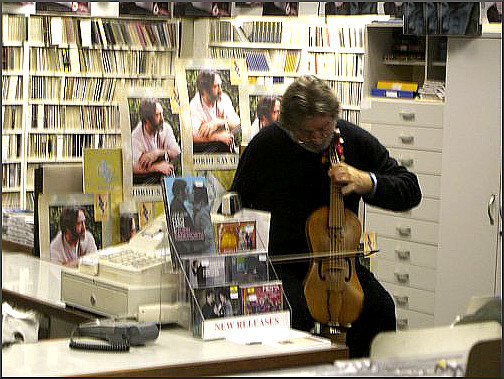 These photos were taken by me in 2008 at independent record retailer Prelude Records in Norwich. Jordi Savall's impromptu viol recital and signing session preceeded two performances at the Norfolk and Norwich Festival. One was a solo recital by Jordi in Peter Mancroft Church; the other was an immensely moving performance of his visionary Jerusalem multicultural project at the Theatre Royal*. As reported here Prelude Records closed earlier this year; it was a victim of predatory online retailing, and today its premises stand empty awaiting occupation by a mobile phone or E-cigarette retailer. The Norfolk and Norwich Festival has been the victim of savage funding cuts, but continues in a more modest form due to the dedicated work of its small management team. A few days ago I wrote about a two-thirds empty Snape Maltings concert and proposed that classical music's heartland is facing a perfect storm caused by the convergence of the shifts in consumer tastes and the rapidly increasing availability of free online content. Elsewhere Craig Havighurst has written about the same problem in a perceptive article titled The Devaluation of Music: It’s Worse Than You Think which lists the death of context, commercial radio, the media, conflation, anti-intellectualism, movies and games and the demise of music in schools as reasons for the sorry state of music today. All the explanations propounded by Craig Havighurst and me are valid and important. But I suggest that there is another more important reason why music in particular and the arts in general are floundering. That reason is that, with a very few exceptions, no one cares any more. Much has been made of the transition from an analogue to a binary age. Not so much has been made of the even more insidious transition from a binary to an algorithmic age. There is a limited understanding of the algorithms used by Google, Amazon, Facebook and other social media platforms to create content filter bubbles which ensure that we stay in our self-defined comfort zones. Even less attention has been paid to how the algorithms virus has expanded beyond online platforms. For example the Guardian uses editorial algorithms to unashamedly slant its journalism towards the prejudices of its readership, and concert promoters use subjective algorithms to present concerts of familiar and non-challenging repertoire. The problem is that no one cares that this is happening. In fact everyone feels very contended in their own comfort zone with ever faster broadband, ever cheaper streamed content, ever more friends and followers, ever more selfie opportunities and - most importantly - ever fewer challenges to their prejudices. And the media - particularly the classical music media - is quite happy to play along; because keeping your readers in their comfort zone means keeping your readers. The history of art, whether its music or written or what have you, has always been bloody, because dictators and people in office and people who want to control and deceive know exactly the people who will disturb their plans. And those people are artists, they're the ones that sing the truth, and that is something that society has got to protect. Those are stirring words. But the insurmountable problem is that today the vast majority no longer care about protecting the arts. And we are all to blame. This article is being written on a free blogging platform provided by Google, the pioneer of algorithmic determination. If it reaches any audience at all it will be because it is favoured by the algorithms of Facebook and Twitter. However, it is unlikely to reach any significant social media audience because my views are not favoured by the online vigilantes who police the borders of classical music's comfort zones. And for the same reason the dissenting views expressed here and elsewhere are unlikely to find their way into the Guardian or Spectator or to be aired on BBC Radio 3's Music Matters. But why should any of this matter? Why should people care when they can watch safe within the comfort zone of their own home an outstanding performance lasting 2 hours 44 minutes of Berlioz's Damnation of Faust by the world-class forces of Simon Rattle and the London Symphony Orchestra recorded in high quality video and audio for free on YouTube? There is no viable solution because we are all part of the problem. Classical music's biggest challenge is not ageing audiences, disruptive business models, institutionalised discrimination, unsatisfactory concert halls etc etc. The biggest challenge facing classical music is adapting to a society in which no one cares about anything except staying firmly within their own algorithmically defined comfort zone. 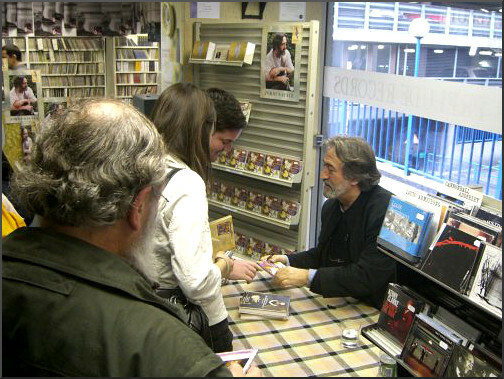 * A transcript of my radio interview with Jordi Savall recorded in the 2008 Norwich & Norfolk Festival can be read via this link. Any copyrighted material is included as "fair use" for critical analysis only, and will be removed at the request of copyright owner(s). Also on Facebook and Twitter. Gerald Trimble's words, "A brilliantly true assessment...", I can only second. Given past reception of your most noteworthy posts, I think he may underestimate how many will read this one. Such, at any rate, is my hope, for it deserves and needs the widest broadcasting. Hello, Firstly let me introduce myself. I'm a Jordi student studied with him in Basel from 1980 - 1981 then 1984 - 1985. Thanks to Jordi I met my wife Sylvia who also was one of his students. I have lived in Paris since 1985 and agree totally with your point of view. For five years I organised baroque music concerts at the Musée Carnavalet here in Paris, then for as many at a small theatre l'Archipel. We also are witness to the deserted concert halls the apathetic public. I also am on the same wavelength as this digital revolution has turned us sort of into zombies where, we all, but especially the younger generation think music is something on youtube, or on Spotify. We have less concentration I believe than beforehand. Very hard for a 25 year old person to sit through one hour or more of music. On top of that often presented where we are in a cold church, sitting on an uncomfortable seat, and all the ritual of not moving, making any noise and clapping when required. LO on him who claps after the first movement. This in fact for baroque chamber music was never the way it was intended to be presented. From Café Zimmerman to the Parisian salons or consorting of masques at the banquet house. We can also attest to the fact that worldwide the audience is aging for baroque music. The same people that were there when I started in the 70s make up the largest part of the concert goers. As I still continue to perform I have given much though about this. I think if we can present baroque music in a more relaxed atmosphere, such as it was done in a Parisian salon, where the main attraction was the wine, we may attract the much needed new generation to our concerts. As I am also a sound engineer I have absolutely no qualms about using good amplifiers and microphones. Often myself as well as Jordi when we perform solo on the viol in front of up to 2000 people at the time, there is no choice. I may have "a viable solution" in part. That is I have decided to start a series of baroque concerts here in Paris which I have named BARoque. It will be on a boat near Notre Dame. The audience will be sitting at tables, with food and drink. As the concerts will be amplified people can eat, drink, talk move about. As the boat is also a jazz club it in fact will be the same conditions. Starting next year in February this is my challenge. Let me see by implementing my ideas if I can sway the under 40 generation back to baroque music. Thank you for reading my lines. All power to your (bowing) elbow Jonathan, and every fine wish for the BARoque concerts. I am not convinced the author of this article is correct that "The biggest challenge facing classical music is adapting to a society in which no one cares about anything except staying firmly within their own algorithmically defined comfort zone." Indeed, I feel this article is quite limited in its outlook. (1) First of all, the historical composers would probably be gratified that people are still listening to and playing their music centuries later. I'm listening to François Couperin as I write this -- how many of today's composers and musicians will still be known in 300 years? (2) I would venture that classical music is heard by far more people now than at any the time since it was composed, when only the most wealthy would have had the chance to be present at a performance. (3) Classical, largely bourgeois and European, is competing not against algorithmic sameness but against ever-increasing diversity of music from every corner of the world, not to mention the proliferation of alternative forms of entertainment. Also, youth today want their own music, not that of their parents or grandparents. (4) Classical is hindered by economics: the middle class is disappearing; few can afford $100+ symphony tickets when there is ample free or cheap music being played live at the local bar or available online. (5) Classical is hindered by its rigid expectations on the audience, requiring that they sit, well-dressed, in utter silence during the performance. People want to move, to dance, to drink, to talk (the latter being very annoying, of course, but I suspect conversation was occurring even among the courtiers on King George I's barge during the premiere of Handel's Water Music). Theatre and cinema are likewise hindered. Even the danceable forms of classical are hindered by their requirement that one know the steps of a waltz, a menuet, a quadrille, a sarabande. (6) Classical is hindered by its rigid performance expectations -- every note must be played as written, with extremely limited opportunity for the musician to interpret compared to much more accessible forms such as folk, blues, jazz, rock, African drum circles, et cetera, where improvisation is routine and expected, and the barrier for entry by less virtuoso players and composers is lower. The best classical performance I ever saw, in part because it was so unexpected, was Yo-Yo Ma improvising on cello during the intermission of a formal concert in Paris. Personally, I know I can never play the piano well enough to perform a classical piece in public, but I was able to hold my own in a rock band as a hobby. (7) Current composers of classical are competing for fame against a backdrop of immensely talented historical composers, as well as against current non-classical performers with vast audiences. (8) Classical, on an orchestral scale, is hindered by the daunting logistics of having so many musicians involved. Contemporary composers who wish their music to be performed routinely should perhaps focus on chamber music instead of grandiose symphonies. (9) Finally, the popularity of classical is hindered by its intellectuality -- true appreciation requires a thinking and understanding public in a time when careful thought is rare, and it is competing against compelling lyrics (largely forbidden in classical) that speak to the heart or more clearly express the soul of the composer, and against the primal nature of a compelling dance beat which operates at a more visceral level. Hey Jonathan! Good idea, with a good name too! Salut Jonathan! A good idea, and with a catchy name to it too! Kudos !! Here in the United States, PBS and NPR have betrayed classical music. They no longer even bother to expose their audiences to it, except for maybe the occasional glitzy concert with young, "hot" talents, or else the Vienna Philharmonic's New Year Concerts. And even with the Vienna performances, half of the concert is thrown away and replaced with tour guide visuals and narration. Classical music just doesn't matter any more to PBS and NPR, and they are raising another generation that won't care about anything but rock and pop and rap. Jeff has hit the nail on the head. It's primarily cost.....the cost of a ticket for a live concert, the cost of putting on a concert with 40 musicians, even the cost of a chamber ensemble. We are careful which live concerts we go to and end up in the expensive cheap seats. Admittedly listening to music in your own home is not the same but it's a hell of a lot cheaper. Best of luck to you on your venture, Jonathan Dunford! We all have to think outside the box to survive in these tech heightened times with audiences incl some with limited attention. We're making it in Kansas City of all places entering our 18th season, yippee! This article raises a very important issue that should be very carefully be taken into consideration by the music industry and especially by the people designing the new technologies: namely, that technologies such as recommendation systems are seriously harming the "biodiversity" of music. I think the Music Information Retrieval community, in particular, should take the time to become aware of this important problem, and should develop strategies, including axes of research, to counteract these highly worrying developments. Maybe research have already been developed along those lines, in such case it would be important to learn more about them. Amen! Welcome to the Short-Attention Span Classical Station: we cannot play entire symphonies any more, only movements lasting 5-8 minutes, just a little bit longer than the epic miniatures of genius found on the Top 40 Rock, Rap, Country, etc. stations. One Dvorak Slavonic Dance, a Haydn Scherzo, a movement from a suite e.g. Peer Gynt, an aria from an opera, etc. etc. etc. At the best, a rookie might be intrigued by a piece and find the entire work and listen to it. "Classical music just doesn't matter any more to PBS and NPR, and they are raising another generation that won't care about anything but rock and pop and rap." One of the problems with classical music is that its audience disdains contemporary music and projects a holier-than-thou attitude. Why sneer at rap? It is a valid art form. I applaud the Chicago Symphony Orchestra, the San Francisco Symphony and other organizations that have teamed up with the likes of Mason Bates to bring contemporary composition, and even turntables, into the concert halls. Classical music is suffering because it's not seen as relevant. That said, many pop, rock and rap fans do appreciate it and understand the historical significance of Beethoven, Mozart and other classical composers. They just don't put those composers on a pedestal. Very interesting discussion. 300 years ago listening to any music was an event - you had to go to it, it was temporal and quickly over. Today music is permanently on, 24/7. People generally are swamped with it all the time, even to the extent that you go to a live performance and in the interval there is more music playing, in the bar, in the toilets whatever. People are accompanied by music permanently through phones,computers,ipads, every device to the extent that it appears many can't stand silence. On Radio 3 even, music of different styles and intensities are butted up against each other with merely seconds between them. How can you recover from the emotional experience of an exquisite Schubert lied in time to accommodate a few seconds later a Pomp and Circumstance march. We are blasted with disparate music with no time to assimilate or reflect. The soundbite age dictates this it seems and classical music is doing the same. We are perhaps over-stimulated with too much availability of every style and fashion. Classical music is just trying to survive in an ever multiplying market place; it's up to the people who love something to care enough to support it in whatever way they want. Classical music's biggest problem is that it is not directed by artists. Mainstream Classical music is like all the other Arts, controlled by a new breed of artists, con artists. Example: "My Bed" and the countless "my bed" imitators. Art is not subjective. Only a con artist would say "My bed" and the works of Michelangelo are to be called "Works of Art" or say that today's promoted "classical music" is of the same lineage as Mozart, Verdi, Bach, Massenet or any other composer of the past. Thanks for your article, "Pliable". By the way, would you like to stay anonymous? Olli, no problem at all with my identity as Bob Shingleton being public. The blog has been running for thirteen years and in its early days there was a potential conflict between my day job and the blog. So I used the name Pliable from Bunyan's The Pilgrim's Progress. That conflict of interest has been removed by retirement, but the webname continues in use for the sake of continuity. Thank you for making these points. Well, kudos to whatever algorithm brought me here serendipitously to this page, where who should I bump into but my NEC classmate, colleague, and sometime friend (in non-election years), Jonathan Dunford -- hail, Jonathan! I like very much your BAR idea. It reminds me of something that Chris O'Riley (another friend and classmate from NEC, and host of the NPR show From the Top) has been doing, off and on, with his colleague, the cellist Matt Haimovitz; they have been incorporating contemporary stuff with their more traditional programming, and have been performing in nightclubs as well as bringing their shows around to colleges. There is also this "out-of-the-box" blog: http://www.orchestraremix.com/?p=611. By the way, spelling and subject/verb agreement still matter, even in blogs: "everyone feels very CONTENTED", not CONTENDED, and "the vast majority no longer CARES", not CARE, as majority is singular. Thank you for a very interesting and thought-provoking post, and for the equally interesting and thoughtful comments it has elicited. I will be following you -- I wonder which algorithm will make something of this? As it is, my Youtube page is a jumble of (at a glance this a.m.) Elton John, Fotheringay, Charles Laquidara, Franz Liszt, Lynyrd Skynyrd, Kathleen Ferrier, a bio of Rudolf Nureyev, a makeup how-to, Martha Argerich, and Sandy Denny!